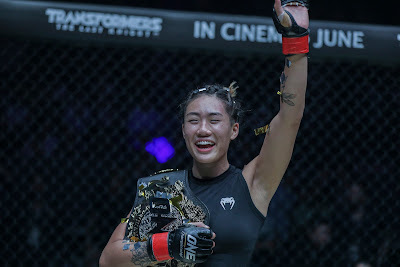 The dazzling rise of Asian mixed martial arts superstar Angela “Unstoppable” Lee continued last Friday, May 26 when she staked her ONE Women’s Atomweight World Championship title against Brazilian contender Istela Nunes in the main event of ONE: DYNASTY OF HEROES. In front of a roaring Singapore Indoor Stadium, the atmosphere was electrifying as confetti rained down on Lee following her victory, marking the second-straight successful defense of her coveted gold-plated strap. Behind her well-rounded offense, Lee stifled Nunes with accurate striking and a smooth grappling game, eventually submitting the two-time Muay Thai world champion via anaconda choke in the second round. Lee may have made it look like an easy night against Nunes, but there were extra challenges than simply overcoming a tough opponent. 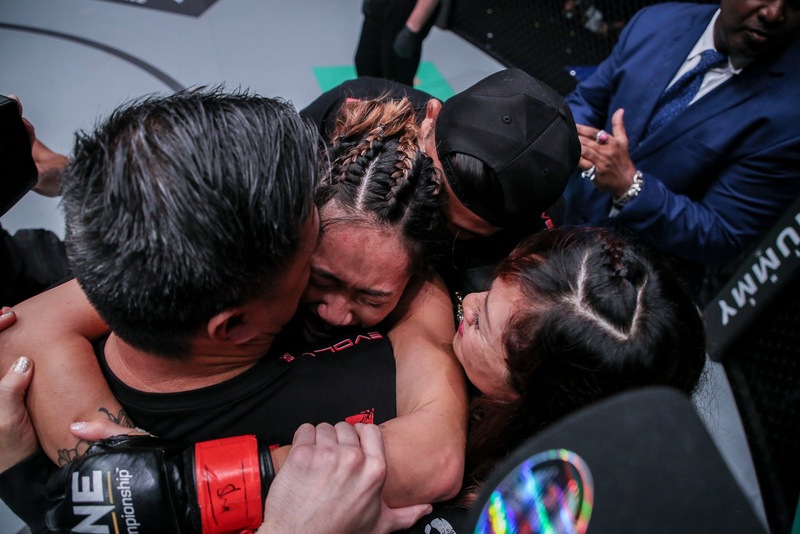 After getting the tap from Nunes, the 20-year-old Singaporean sensation dropped to her knees in the middle of the cage and broke down in tears. It may have seemed at first that Lee was simply overjoyed at securing the win, but it turns out that the champion had to overcome a severe bout of pneumonia before even stepping into the ONE Championship cage. Ten days before the bout, Lee had been battling illness as she had been diagnosed with a bad case of pneumonia. “There were a lot of things that happened leading up to the fight, a lot of unexpected things that I didn’t have control of. I actually got pretty sick leading up to the fight. I was on antibiotics and stuff so I was fighting through that. It was just a very tough battle with myself, overcoming my own doubt,” Lee shared. Despite showing symptoms of a serious ailment, Lee decided to proceed with her highly-anticipated championship clash with Nunes. "I was nervous but I also knew how hard I worked for this. I believe that everything happens for a reason and I trusted in that. If I could make it this far, what's 30 more minutes? So I walked out to that cage with a smile on my face and got the job done," she stated. Lee had battled through so much more than just the challenger opposite her inside the cage, and she had won in spectacular fashion. “This victory means the world to me. I got the finish and I cannot ask for anything more than that. I trusted in my training, trusted in my team, my coaches and I just went out there and got the job done,” she said. “That's why I was so emotional after the fight. This win meant so much to me because I had overcome my biggest test. Not once did I think of giving up or calling off this fight. That's not who I am. I'm a fighter and I choose to be fearless in the face of adversity because resilience is what leads to victory," Lee added. ONE Championship Chairman and CEO Chatri Sityodtong praised Lee for her dedication to her craft and demonstrate her heart of a champion. “My Muay Thai teacher, the legendary Kru Yodtong Senanan, used to tell me often that a world champion is someone who can win under any circumstance. Angela Lee passed an impossible test on the journey of unleashing her greatness,” he said. Believing that Lee exemplified the true spirit of martial arts in her world title defense, Sityodtong maintained that the outstanding female fighter known as “Unstoppable” should be regarded as one of the best world champions of the sport today. “Without a doubt, Angela is one of the greatest World Champions on Earth in any weight class - male or female. She is a true warrior who exemplifies the authentic spirit of martial arts,” he stressed. At 20 years old and at such an early stage in her professional MMA career, Lee asserted that she is still building towards her legacy. “I'm maturing as a fighter, but I still have so much to learn. That's the exciting part. I feel like I'm not even close to my peak or my potential yet," she ended. ?For more updates on ONE Championship, please visit www.onefc.com, follow us on Twitter and Instagram @ONEChampionship, and like us on Facebook at https://www.facebook.com/ONEChampionship.